While giving a great wedding speech can seem effortless for some people, the mere thought of publicly expressing humorous and heartfelt congratulations to a newly-married couple can be extremely stressful for others who don’t feel that they have the “gift of gab.” This article is geared toward helping those people overcome their anxiety and make a memorable wedding speech. Focus on the key points of a wedding speech: thanking the couple for inviting you, championing the institution of marriage and wishing the couple much marital success. For example, you could begin with “It’s an honor to be a part of such a special event.” From there, you could share memories or thoughts about the couple before you end your speech with a toast. Make sure that your humor is family-friendly. Inside jokes and recalling bits of private conversations that seem harmless to you and one or both of the newlyweds could be off putting to someone else. Some wedding planners suggest that your wedding speech should not include sexually-suggestive or gender-based jokes because you may unintentionally embarrass or offend some of the guests. Timing is very important when it comes to speeches. According to various social etiquette websites, the average wedding speech takes about four minutes. Knowing this will help you stay focused. Once you have a general idea of what you plan to say, you may want to use a timer to decide where you need to edit yourself. Remember to cut yourself some slack because nobody is perfect. It’s okay if your voice cracks or you’re nervous or you get “choked up” while you’re giving your speech. Weddings can bring a lot of emotions to the surface for some people, so those things are not uncommon. Focus on wishing the newlyweds the best as opposed to striving for perfection while you’re speaking. Even if your relationship with the couple is casual or relatively new, you don’t want your words to seem too generic. To prevent this, you could stick to the aforementioned key points of a wedding speech and make it known that your relationship with the couple is not “personal.” To do this, you could begin your speech this way: “While we haven’t known each other very long . . .” and then follow up with a few kind words about the first time you met your colleague’s spouse. Don’t be afraid to draw inspiration from others when you draw a blank. This method can be great if, for instance, you have spent hours or days staring at your monitor or a sheet of paper. You may find new inspiration via a passage from one of your favorite romantic books or movies by referring to a scene from either source as an opener for your speech and go from there. Practice reciting your speech in front of others before the big day. Having another set of ears, or multiple ears, will help you trim the fat or fatten up parts of your speech. For example, a friend will be able to tell you if you are repeating yourself, talking too fast, mumbling or even fidgeting. Find out in advance exactly when you are expected to give your speech so that you won’t be caught off guard and possibly embarrassed later. If a wedding planner has been hired, speak with him or her to find out who goes first, second, third and so on. Don’t use alcohol to “steady your nerves.” It’s better to be slightly anxious while you’re giving your speech than it is to be slightly inebriated. Hello, I would like to thank Brad for all the wonderful things he just said. For those of you who may not know, Brad and I have known each other since we were in grade school, so I can assure you that he has never been happier than he is right now, and with good reason. Debbie is everything he has been looking for in a wife. Everyone, please raise your glasses and join me in toasting my dear friend and his lovely bride. 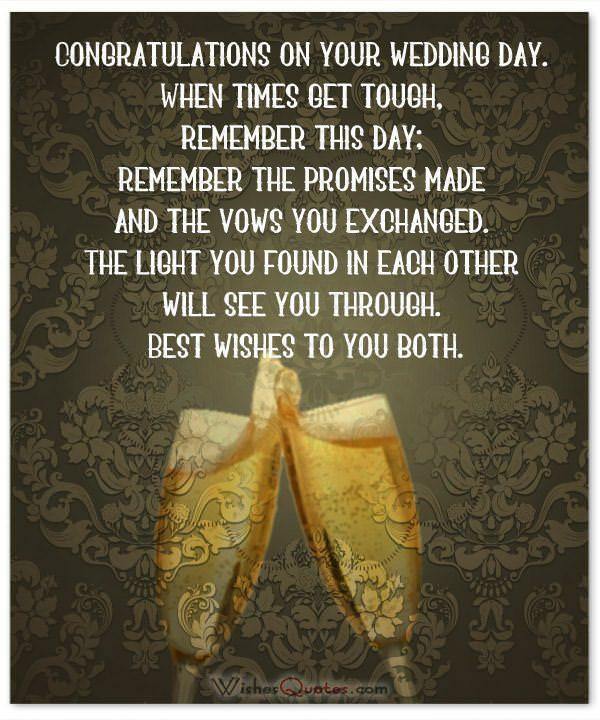 To Brad and Debbie, may your marriage be filled with nothing but love, happiness and prosperity. My name is (Best Man’s Name) and as a best man it’s my turn to propose a toast. I have known the groom since the first grade, wow! it seems like yesterday, But i can tell you one thing since the (Groom) met the (Bride) he totally changed, I could tell he was in love he started walking with a goofy look on his face and spent all his time on the phone he was totally smitten. But seriously i have never seen him this happy before and i wish you both a great marriage together full of love, joy and happiness. Here’s to the Bride and Groom. First, I just have to say that you guys make a gorgeous couple. Now I want to let the rest of you know that I am not just talking about the wedding dress and the tux. Molly and Robert are just as beautiful on the inside, and I am not just saying that because Molly is my sister. Molly has a great heart and she has always been in my corner, so it’s wonderful to know that she has found a kindred spirit in Robert. Robert and Molly, I love you and I wish you nothing but the best. Cheers. As a friend/sister to the Bride i have seen your love grow from the first day you two met and i know how much you love each other. To the Groom you are the best man for my friend/sister you treat her so well and thank you for making her this happy i wish you love, money, good health and all that you wish for. Here’s is to Mr. and Mrs. (Groom’s name). I can’t fully express just how happy I am right now or how much I appreciate the well wishes. Let me just say that standing here with Amy by my side lets me see just how fortunate I am to have actually found the kind of love and support that some people spend a lifetime looking for. Not only does Amy help me by completing my sentences, but she also completes me as a person. I also want to personally thank and toast my best man, the lovely maid of honor and bridesmaids. I love and respect all of you. I remember the first day i met (Bride’s name), i saw you across the room and i knew i had to talk to you, your smile was so bright and inviting i knew i had to get to know you more. You are the most beautiful girl inside and out and i will spend the rest of my life loving you and giving you my all, let’s all stand up and raise our glasses to Mrs. (Groom’s name). Zachary, I love you so much and I feel blessed to be able to celebrate our love in front of our family and friends today. To my in-laws, Samantha and Victor, I want to thank you for welcoming me into your family with open arms. You are a lovely couple, and I hope that Zachary and I have a marriage that is just as warm and inspiring as yours. Mommy and Daddy, thanks for reading me fairy tales when I was a kid and promising me that I would indeed meet my prince one day. You were right. Here he is. Am honored to be your wife today (Groom’s name) You are a dream come true, a real knight in shining armor. i love and cherish you so much and i can’t wait for our future together. Am very grateful for all our guests for attending our day i know some of you traveled a long journey to be with us today, thank you for coming to celebrate with us as we become Mr. and Mrs.(Groom’s name). In spite of her objections to marriage as a tomboy, I knew that Teresa would find someone who would love and support her one day. That day has finally come, and I had mixed emotions when I was giving Teresa away earlier. Part of me still sees, and misses, the tomboy who loved her basketball more than anything else, but I also see the woman who loves Peter more than anything, which is wonderful. Peter, you’re the kind of man a father hopes his daughter marries, and I’m happy to call you my son. Peter and Teresa, I salute you. I raise my glass to toast to my daughter, She’s dreamed of this day since she was a little girl and today as i watch her marry a wonderful man am filled with pride and am confident that her and (Groom) are about to embark on this journey with love and respect for each other and i wish them all the best and may their future be filled with so much happiness. Join me today as we congratulate the Bride and Groom. Good evening, everyone. Although today is arguably the most important day in my son’s life, it’s pretty special to me as well. I see so much hope and happiness in Greg’s eyes that only a woman as lovely as Abigail can inspire. Michael and Kathy, you have raised a wonderful young lady. Greg and Abigail, if I can offer you any advice, it would be to count each moment that you spend with each other as a blessing. 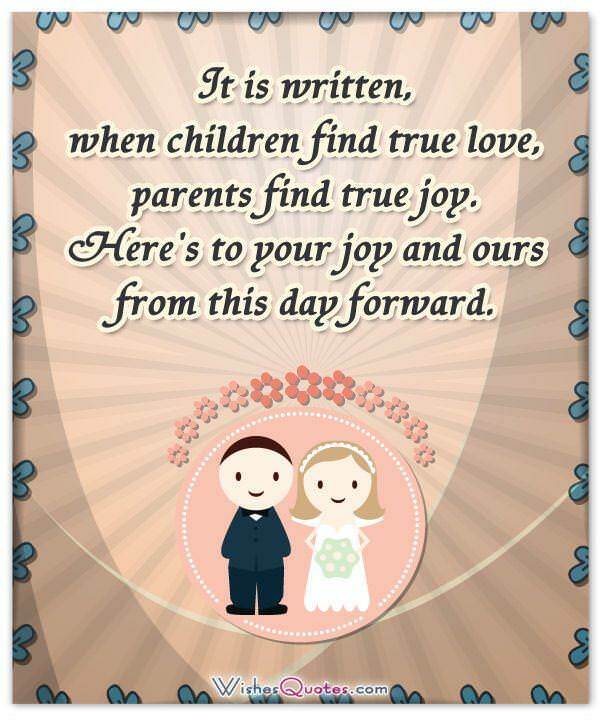 To my son, Greg, and my daughter in-law, Abigail, may the two of you be as happy as I am with Jan.
My name is (Father’s of the Groom Name) and am the father of the Groom. I remember two years ago when Groom(name) called me to tell me he had met a girl and i could tell by his excitement he was in love and today we have all witnessed the love shared between you two, This is just a beginning of a journey together, walk together side by side and let the love you have for each other guide you to the future. Please join me as we celebrate the joining together of the Bride and Groom. Six months ago, Oliver told me that he had met the mother of his children and I assumed he was joking. It wasn’t until he actually introduced me to Cassandra that I knew that he wasn’t kidding. Cassandra, you have proved to be every bit as classy, warm and intelligent as Oliver said you were. Watching you guys exchange vows earlier made me realize that love at first sight is real. My brother knew right away that you were “the one,” and now you’re married. I’m honored to be part of your special day. Cheers to the bride and groom. Achieve Greatness with these Ten Simple Tips! 50 Quotes to Inspire Greatness! WishesQuotes © 2019. All Rights Reserved.